Brussels, 16 October 2008: After a welcome by Dr Hansjörg Neun, Director of CTA, Lluis Riera Figueras from European Commission DG Development and Sir John Kaputin, Secretary General of the ACP Secretariat appreciated the good timing of this 7th Brussels Development Briefing. FAO Director General Jacques Diouf addressed the audience by video from Rome. Lluis Riera Figueras opened arguing that increases in prices would normally lead to increases in food supplies – higher food prices would seem to offer a chance for farmers to boost production and income. In reality however, the supply response has been very slow, because information does not reach the farmers, and if it does, the farmers may not have the capabilities to respond. This is why a new Commission proposal was urgently needed now, to enable farmers to respond appropriately. Sir John Kaputin underlined the seriousness of the situation and the problems small farmers are facing. He also underlined the importance of the All ACP Agricultural Commodities Programme and the need for additional funding in this framework. 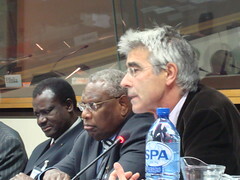 Marking this World Food Day, Jacques Diouf framed the debate by recalling how food prices have dramatically increased in 2006 and 2007, peaking in July 2008. A simultaneous increase in demand for food crops while supply has tightened has been the main cause of the problem. Several elements combined to cause this situation: the effects of climate change, resulting in droughts and flooding, hence a reduction in available stocks; a rapidly increasing world population; increasing allocation of land for biofuels production; rising oil prices; as well as commodity speculation. Small farmers have been particularly affected, and the already high number of malnourished people has increased dramatically. Mr. Diouf argued that the situation has its root causes in the low priority given to agriculture over the past decades. The numbers are clear: Overall development assistance targeted to agriculture has fallen from 17% in 1980 to 3% in 2006. International and regional donors have drastically cut resources for agriculture, despite this still being the primary activity for most poor people. What needs to be done? Mr. Diouf argued that agricultural production needs to double in order to feed an increasing world population. As this population will more and more be found in urban ares, agricultural productivity also needs to be strengthened, especially in developing countries. This can be achieved only with investments in rural infrastructures (access to water, roads, etc) and by modernizing production systems. At the High-Level Conference on World Food Security (December 2007), FAO invited the donor community to allocate 1.7 billion US Dollars to smallholder communites in developing countries – to buy seeds and other inputs they need. FAO has committed initial resources to 69 countries. While this needs to be backed up by other donors and governments, he concluded by calling for a long term plan of increasing investment in agriculture as the only way to ensure sustainable world food security.